Three members of the Adair County school board provided the majority needed to approve a 4 percent tax increase that will be added to upcoming tax bills. Lisa Burton, Terry Harvey, and Mike Harris all voted in favor of the increase; Daniel Adams and Jonathan Gaskins voted against the increase. 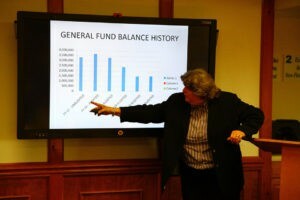 Superintendent Dr. Pam Stephens addressed the board and recommended the 4 percent increase in revenue tax rate for 2018 during a PowerPoint presentation over the district’s data trends, bond payments, no control expenses, insurance expenses, budget expenditures and the uncertainty surrounding the Kentucky retirement system. Pellyton resident Will Pilkington came to the meeting and spoke against the increase in taxes, citing that the extension district is also planning on adopting a four percent increase this year and if both go through with the increases, Adair property owners will see an eight percent increase. “Don’t give yourself a pay raise and then ask me to pay for it,” said Pilkington to the board. “We already have a hospital and occupational taxes and there are no good paying jobs around unless you’re a doctor or on the school board. When does the tax increase stop? No one should live in fear of being taxed out of their home and to ignore financial consequences like this threatens to drive families out of this county,” said Pilkington. The board discussed that the four percent increases will generate approximately $134,000 if the district collected at a rate of 100 percent. Last year the district brought in $3.4 million with the compensating rate and will bring in approximately $3.6 million with the 4 percent increase.